Magyar Iskola in form and content, is a new and original series for learners of Hungarian. Based on the methods of Koháry, in country's leading centre for the teaching of Hungarian to foreigners, it helps learners to master the Hungarian Language quickly and effectively. Magyar Iskola combines the most effective-to-date communication-centred methods with the proven frame of grammar acquisition. The emphasis is on developing conversation skills in everyday situations. Clear explanations, logical visuals, and colourful exercises promote the acquisition of the vocabulary and grammar needed in these situations. 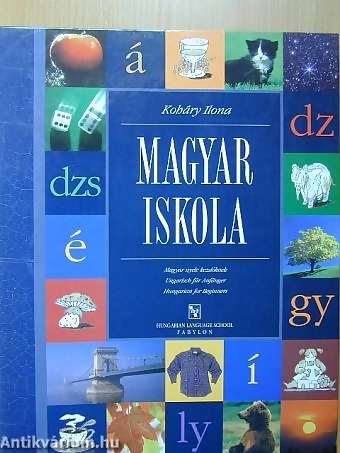 A unique feature of Magyar Iskola is that it is published in ring-folders, allowing learners to add and to individualize their learning resource as they go along. Magyar Iskola is the most richly illustrated Hungarian textbook ever published, with songs, poems, and even board games helping to make the learning process enjoyable as well as effective. The learner will also acquire knowledge of Hungary's historic and present day values. Cassette tapes and self-correcting exercises help learners to study on their own. Magyar Iskola is in five parts, backed up by five cassettes and three board games. Through the most up-to-date communication methods, the learner will be able to use the Hungarian Language effectively in the most common situations as soon as possible. The emphasis is placed on comprehension and on the improvement of fluency. All lessons are logical and clearly structured. Each of them treats an essential situation from everyday life. Numerous exercises help the student to use the most common courtesy formulations. More than 1500 pictures and coloured photos help the learning of the basic words and phrases. In addition to vocabulary building many-sided, entertaining exercises explaining the meaning of words; spelling and necessary grammar structures are also highlighted. Crosswords, 'word-nets', 'hide-and-seek word-exercises', as well as songs make learning varied, enjoyable and efficient. Beginning from the basics, Magyar Iskola treats the most important linguistic structures in a logical, transparent form. Each lesson consists of two parts: the first one contains explanation and illustration, the second one includes a series of colourful exercises helping the student to use grammatical structures already learnt. Grammatical table summaries ensure easier understanding. The exercises develop not only a conscious and correct use of Language but reading and comprehension abilities as well. The package is recommended for learners from the age of 14 and young adults.